When the weather gets warmer and it finally stops raining there are two things that my family enjoys doing and that is hiking and going to the beach. It would be allot easier if people would just call it beaching instead of going to the beach. I would say for my two kids and I the beach thing is preferred over hiking. But for my husband he would prefer hiking in the backwoods any day. Lets just say I have to twist his arm a bit to get him to come with us to the beach. As far as both activities are concerned it is important to use sunscreen to protect your skin from harmful UV rays. A good sunscreen will not only protect your skin from the discomfort of sunburns but it could also help prevent some skin cancers. Did you know that according to the Skin Cancer Foundation men over 50 are more than twice as likely to get skin cancer when compared to women. Not that my husband is 50 yet but this report made me think. 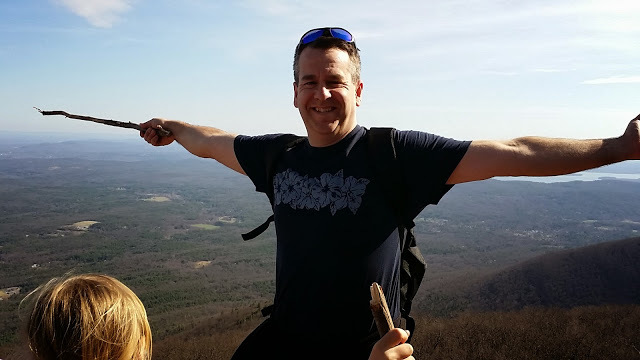 My husband for years would go out hiking, bike riding, or working in the yard without wearing sunscreen. He would always tell me that the sunscreen would come off when he sweated so it didn’t make a difference anyhow. Recently I was introduced to a bunch of new products from Banana Boat with one of them specifically designed for men. It is called Banana Boat Triple Defense Sunscreen for Men. It contains ActiveProtect Technology, which provided heavy-duty UVA/UVB protection, which kicks in when the suns rays are the strongest. This formula also combats odor, even while your man is sweating, and it helps hydrate the skin. It is available as a lotion or a clear mist in SPF 30 and SPF 50+. I gave it to my husband or should I say I applied it on my husband the other day before he went on a 4-hour hike in the mountains. I applied a small dot of Banana Boat Triple defense for men and started rubbing in. 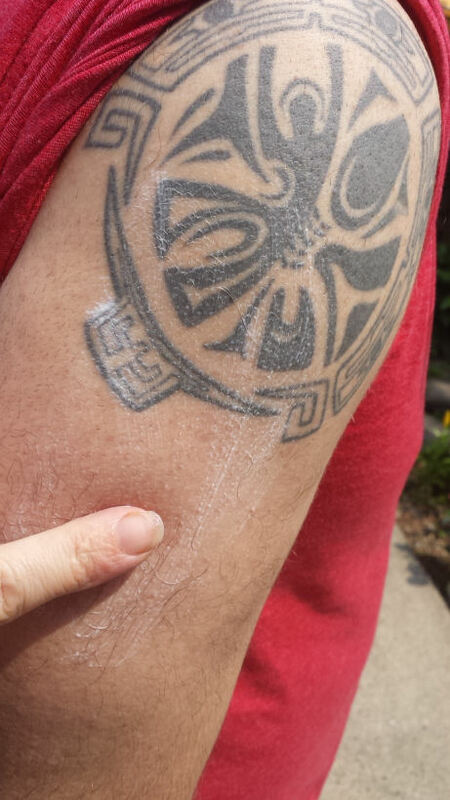 TIP: remember, when you apply the sunscreen on your shoulder, make sure you cover the entire tattoo as well, because not only the skin around your tattoo gets sunburned too, but it may cause tattoo to fade from the sun. So as Iwas rubbing the cream on to the skin, I noticed how smooth and soft Banana Boat Triple defense for men went on. No crazy excessive rubbing-in was needed. It was lightly perfumed with the pleasant odor. 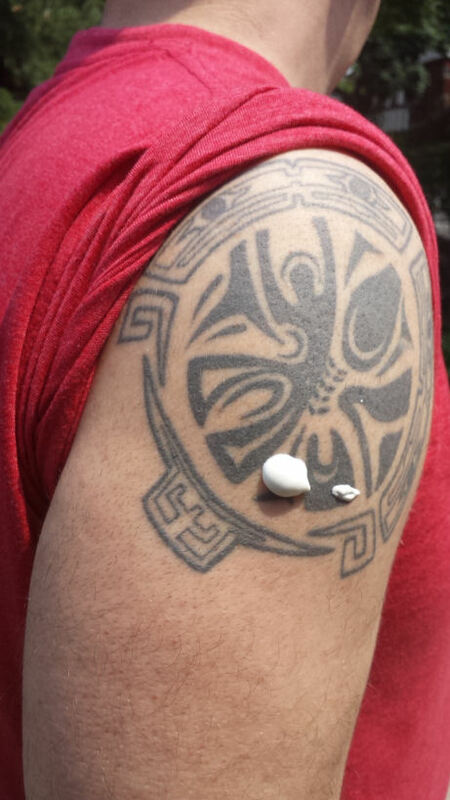 In the photo above I left a bit of lotion on his shoulder to show you how clear and smooth it goes on the skin, with no leaving white sticky residue. I also put the bottle in his backpack so he could re-apply it if he felt necessary. He assured me that he had no plans on spraying himself in the middle of the trail but appreciated the gesture. About half way through his hike I got a text from him saying, “It’s still on my skin and working even though I’m sweating up a storm”. I texted him back saying that I was glad and that I would see him soon. He also texted me back this pic with awesome scenery in the background. Later on that evening when he came back from his day trip he didn’t have the familiar red-sunburned nose, neck, and, shoulders. He was a little bit tanned but didn’t have one bit of sunburn. I asked him if he reapplied the sunscreen and he said he didn’t have too. 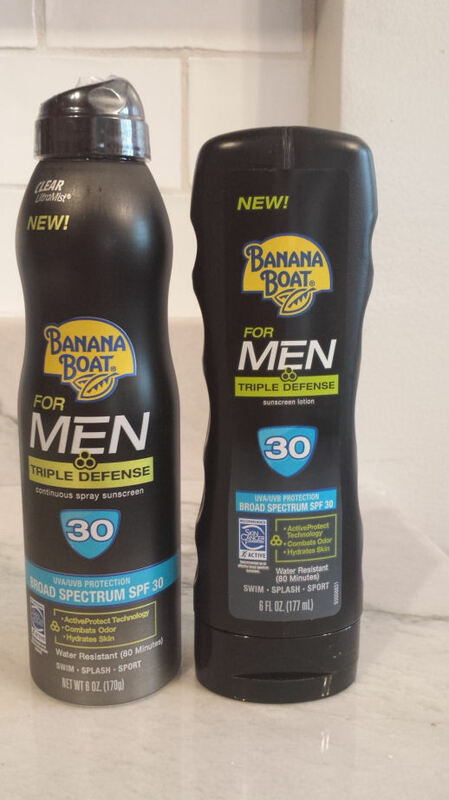 Overall my husband was pleased with the performance of Banana Boat Triple Defense Sunscreen for men. He liked that fact that it didn’t run and was not greasy or sticky. Overall I’m happy because now I get peace of mind when it comes to sun protection and my husband. Banana Boat® has teamed up with actress and mother of two, Busy Philipps, to bring moms and their families the tips, tools and fun prizes they need to have the Best Summer Ever! Visit Banana Boat Facebook Page www.facebook.com/BananaBoatBrand to learn about the Banana Boat Best Summer Ever Sweepstakes. The Sweepstakes ends on July 31, and you could win one of several summer fun daily prizes – gift cards, Banana Boat prize packs, toys, movie tickets or even the grand prize, a family vacation to a Treehouse Resort. It sounds like so much fun! Tell me how your husband or your dad uses the Triple Defense Sunscreen for Men. Does he wear it to do chores outdoors or does he apply it to go golfing, hiking or swimming? looks like i will be making a trip to the store for my husband soon, he has a family history of skin cancer and is red headed so he definitely needs this. I didn’t know there was such a sunscreen designed and formulated just for men! I will have to tell my husband about this! I really did like your review. I am interested in buying Triple Defense Banana Boat for men for my husband, he is 50 so as his doctor has said he’s got to much sun over the years that he needs sunscreen. I like that even though your husband sweat the Sunscreen still stayed on. I’m going to have to get some and some special kind for me too. Awesome sunscreen! I did not know Banana Boat has suncreen just for men. I am going to get some of this and make sure my Dad and nephew wear this. Guys do not like to wear sunscreen. I have used and loved Banana Boat products for years. I cant wait to get some of this for my boyfriend, he spends most of his days out in the sun, so he can really use some of these Banana Boat products! Loved your review!! 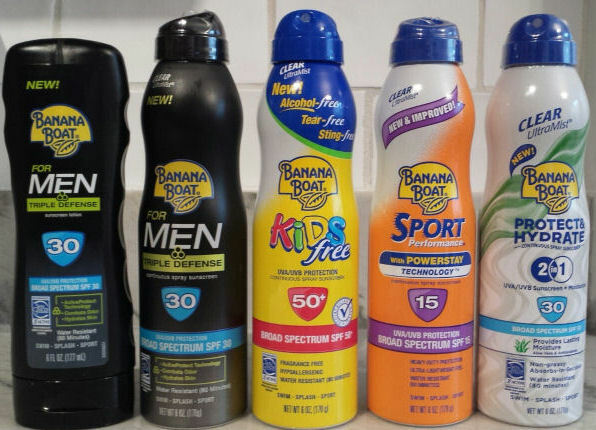 I have loved and used and loved Banana Boat products for years now!! I cant wait to get some of this for my boyfriend who spends most of his time out doors for work! Thanks for the awesome review!! I didn’t know they made one specifically for men. That’s good to know, I will have to get some. Thanks for this great post! I never know what sun screen to get. I will be picking the KIDS one up for my two children and the MENS one up for my husband! Good to know these don’t come off like other sun screens do! He’s worse than a kid when it comes to me spraying or slathering something on his skin. Thanks for the post and your honest review!! I need to get the Triple Defense Sunscreen for Men for my husband. He says the same thing about it just sweating off when he is hiking and stuff. I use Banana Boat for the rest of the family. Thanks for sharing this. We wear it all the time, no matter where we are or what we are doing. We think the sun rays are very harmful so we use it any chance we can. I like that this product is developed for men. My husband doesn’t wear sunscreen usually because of what he calls a perfumy smell. I think I will get some of this for him to try as it is made for men. Great review, informative, interesting, and written well. I’d love for my brother to try this out. He works outside all day and could really benefit from it. All too often my spouse goes out to play golf without sunscreen, partly because he says he doesn’t like the way it feels on his skin. Thanks for the review of this product designed specifically for men. I think we’ll be giving it a try. Nice tattoo! I love Banana Boat products.My fiance’ owns a painting business and I really need to get him some of this!